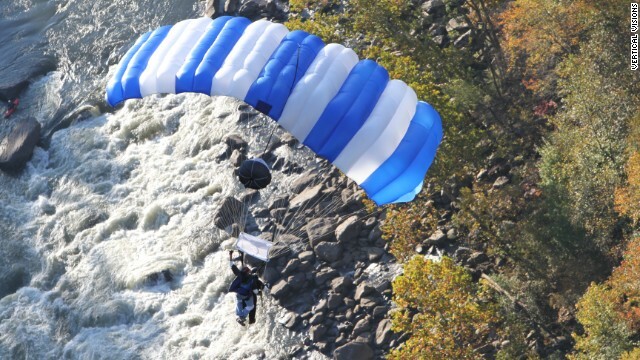 Some 450 BASE jumpers will jump off New River Gorge Bridge in Fayetteville, West Virginia, on Saturday, October 18, as part of Bridge Day 2014, marking the 35th year of the annual celebration. BASE is an acronym that stands for these fixed points: building, antenna, span and earth. At 876 feet high, New River Gorge Bridge is a BASE jumper's dream. Here Kenyon Salo initiated a flip from the bridge on Bridge Day 2003. BASE jumpers jump off fixed objects. Here a jumper leaped off a diving board on the bridge. 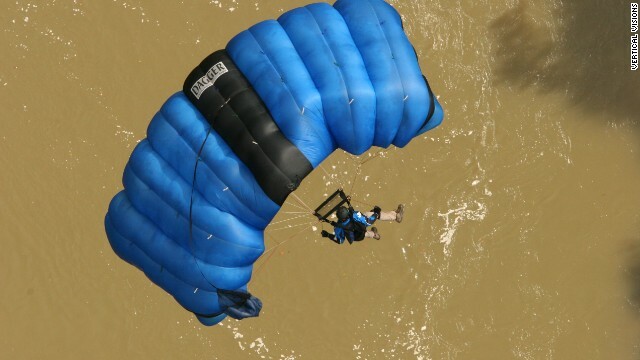 BASE jumpers carry parachutes, like this one, designed to deploy quickly. 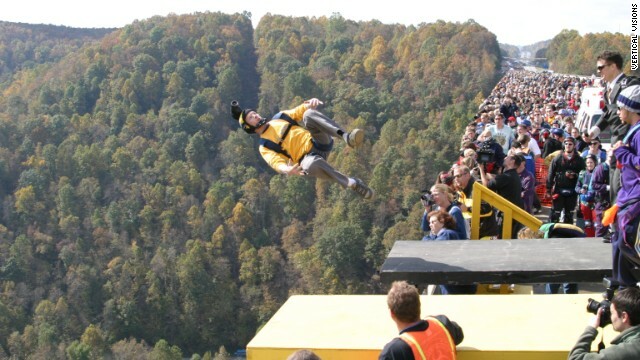 Bridge Day is the only day of the year that jumpers can legally jump off the bridge. Here, four jumpers coordinated their free fall. About 80,000 spectators attended the Bridge Day festival in 2013 to watch the jumpers leap off the bridge and sail to the earth below. 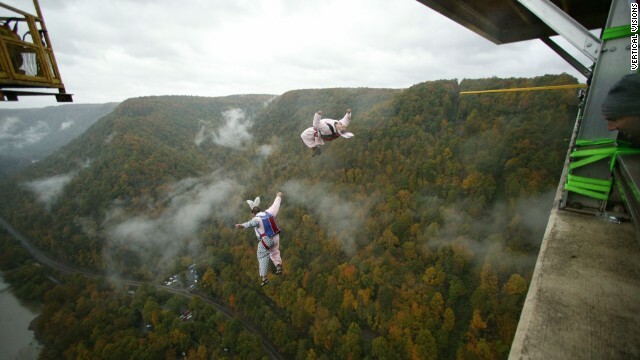 The "Easter Pigs" jumpers perform a two-way jump at Bridge Day in 2004. 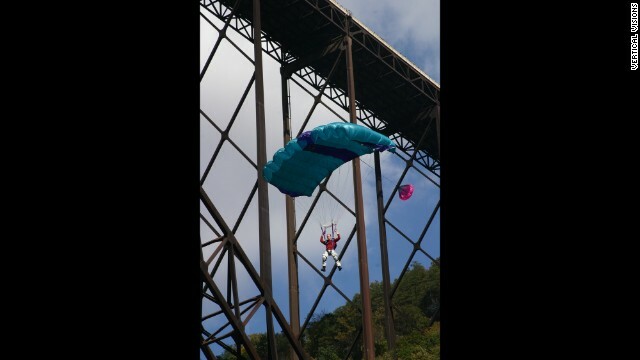 A tandem BASE jump at Bridge Day allows an inexperienced passenger to be attached to an experienced BASE jumper. 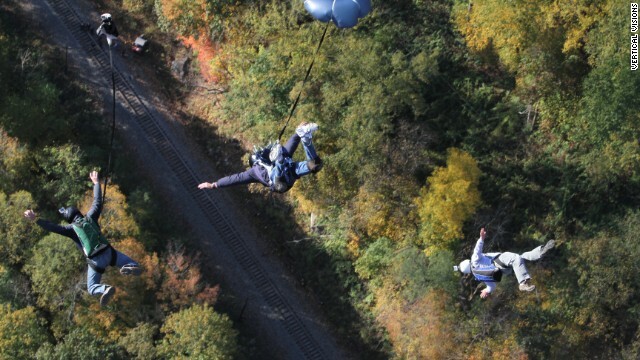 These experienced jumpers show off their skills in a three-way BASE jump at Bridge Day in 2011. 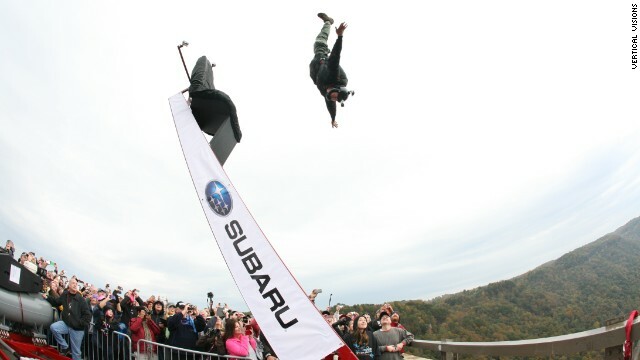 Bridge Day introduced a human catapult system in 2012 to launch a smaller, select group of jumpers up and out from the bridge railing. These jumpers used it in 2013. (CNN) -- We can think of few things crazier than strapping a parachute to one's body and jumping off a bridge for a quick free fall. The 450 BASE jumpers heading to West Virginia for this weekend's 35th annual Bridge Day might disagree. 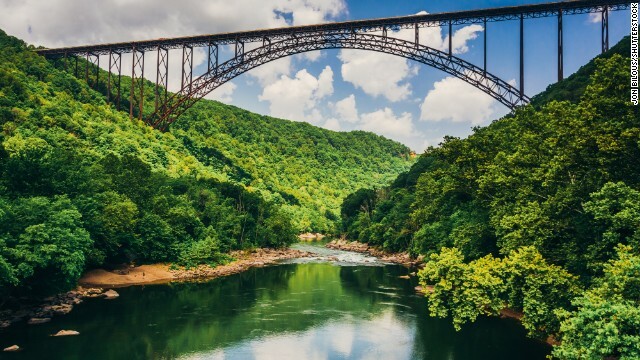 On Saturday they're planning to jump off the 876-foot-tall New River Gorge Bridge, one of the world's longest steel single-span arch bridges, to prove it. It's the only day all year that BASE jumpers -- whose acronym stands for these fixed points: building, antenna, span and earth -- can legally jump off the bridge. The jumpers carry parachutes designed to deploy quickly, softening their landings. The bridge festival, billed as the largest extreme sports event in the world, is expected to attract nearly 100,000 people to Fayetteville. 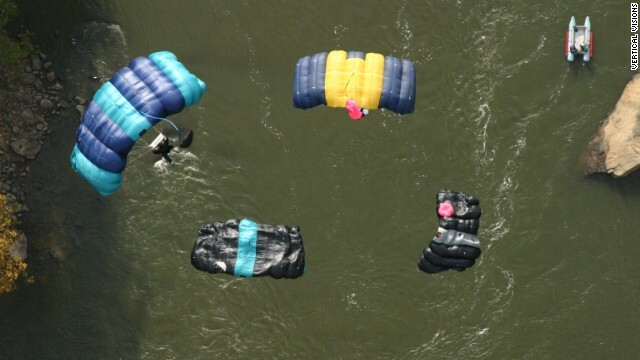 About 450 BASE jumpers leaped off the bridge 903 times at last year's festival, and about 80,000 spectators packed the bridge and surrounding area to watch them. For the second year, a smaller group of jumpers got to use a human catapult system in 2013 to get flung off the bridge. Rappellers get the best views of the proceedings. They like to tackle the bridge challenge, slithering on ropes attached to the bridge from the catwalk underneath the to the gorge bottom, watching the parachutists go by. Vendors surrounding the bridge will offer snacks, crafts and other ways to less strenuously celebrate the jumpers.